To the FA-M3 universal-range controller series that has been continuously improved under the concept of "faster, more compact, and smarter," we have added the FA-M3 R (R for revolution) resulting from the pursuit for higher speed and the WideField programming tool for FA-M3 that presents increased reusability of user programs. With the blistering processing speed of the all-new Yokogawa-developed sequence CPUs and ultra-fast I/O access, the FA-M3 R exhibits 3 to 10 times faster processing than the FA-M3 and is capable of fast periodic task at a maximum speed of 200- µs periods with its sensor control functionality. WideField, which aims at dramatically increasing the efficiency of program development and improving program quality, supports a wealth of features for delivering ultimate program reusability, such as object ladders, component macros, and local devices, as well as fully uses the advantages of the Windows system, such as allowing operations and programming with a mouse and multi-window operations. With the recent rapid advancement of technology, user equipment has become more and more complicated, diversified and faster. This has been imposing an increase in engineering costs and increasingly many users require devices facilitating customization and the reuse of past resources (legacies). To meet these requirements, Yokogawa rolled out the FA-M3 R (R for r evolution) and WideField programming tool for FA-M3 to deliver ultimate program reusability. 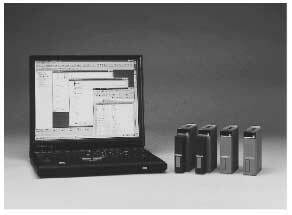 Figure 1 shows CPU modules of the FA-M3 R and windows of WideField. System configurator for setting of device allotment, power failure retention time, preset output levels upon power failure, etc. Table 1 shows the general specifications of FA-M3 R's sequence CPU modules. The design concept of the FA-M3 R was high-speed Instruction-Process-Response-Scan, or ultra-fast IPRS, while inheriting the basic architecture of the FA-M3 and its multi-CPU and maintenance-free features. 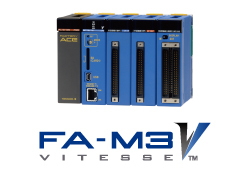 FA-M3 R's sequence CPU modules support upward compatibility with earlier models, thus allowing existing ladder programs and I/O modules to be used without requiring any changes, and the processing speed of an existing FA-M3 system to be increased by simply replacing the CPU modules. We believe that a programmable controller demonstrating speed in all of the four basic aspects of programmable controllers–execution of instructions, processes, response, and scan – can only be said to be a true high-speed controller. We improved and speeded up the Yokogawa-developed sequence processor and achieved drastic reduction in processing time per instruction from 0.09 to 0.0175 µs for basic instructions and from 0.18 to 0.07 µs for advanced instructions. Besides, an intensive review was performed on individual advanced instructions that need longer time to be processed than basic instruction, and the processing time was reduced for each. In particular, access to file registers can be performed within an equivalent time to that for access to data registers, thus achieving 74 times faster transfer between file registers than before. Independent of a normal scan, a high-speed constant-period task can be carried out at a maximum speed of 200- µs periods under the name of sensor control. This enables fast and steady processing of control objects that require especially fast scanning periods, without being affected by the processing time of the normal scan. The scanning period of sensor control can be set within a range from 200 µs through to 25 ms in 100- µs increments. Figure 2 conceptualizes sensor control. 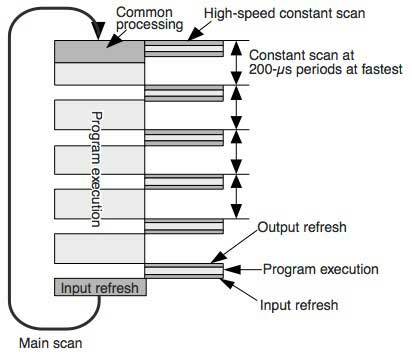 The Yokogawa-developed sequence processor with a built-in high-speed cyclic timer executes a specified task (sensor control) whenever an interrupt is issued by the timer even when an instruction is under execution inside the main scan so that the specified task can be carried out at a precisely constant period. Input/output response: The aforesaid sensor control can reduce the delay of input/output response since it runs a program and refreshes the inputs and outputs at the specified periods. In addition, with the aim of slashing the turnaround time of control processing, including input and output processing, we developed a DC input module with the minimum input circuit delay of 100 µs (with a variable time constant) and a high-speed DC input module with the input circuit delay of 10 µs. Interruption input response: Processing to accept an interruption input was reviewed and the time taken from when an interrupt is issued until when the interruption program runs has been slashed to approximately one seventh of time required before. Burst transmissions are used for module-to-module data transmissions, and by embedding the data transmission function into the ASIC, the data transmission time is shortened, the processor load for peripheral tasks lightened, and the time for execution of peripheral tasks reduced. These measures and the speeded sequence processors (demonstrating a faster execution of instructions) together achieved the scanning time of 20 K steps per 1 ms. Figure 3 shows examples of performance improvements between the F3SP35 and F3SP58, the top-end sequence CPU module model before the FA-M3 R and that of FA-M3 R. The new F3SP58 demonstrates 3.5 to 10 times faster speeds, and the improvement is especially significant for the application of controlling functionally enhanced equipment that contains a larger ratio of advanced instructions, such as cleaning machine control. 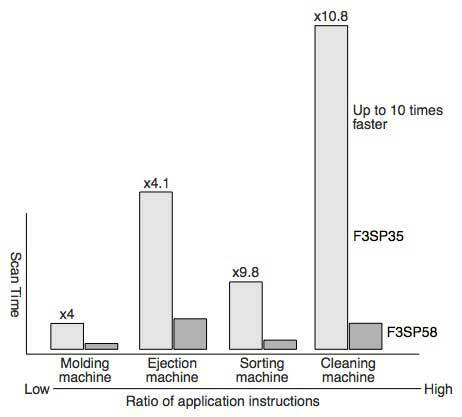 Furthermore, using sensor control will make execution of a task that requires high-speed processing, even faster than these comparison results. WideField is a programming tool used to develop user programs for the FA-M3 and FA-M3 R and offers reusability of user programs and fully uses the advantages of the familiar Windows environment, such as intuitive user interfaces and easy data exchange with other Windows-based applications. Recently, many cases are increasingly seen where the user customizes general-purpose equipment and machines, and hence the user applications for controlling those equipment and machines need to be customized for each user. Accordingly, it has become essential to prepare fundamental parts of a program as shared software parts and standardize a program for identical actions. WideField offers superb reusability of user programs to increase efficiency of program development and quality of the programs, and it is a revolutionary application for programming an object ladder that is based on structured ladders. An object ladder is a new way of developing programs, in which a piece of program and the related devices are assembled for each functional unit called a block. The blocks are then assembled together to form the entire ladder program tailored for each machine or equipment. A unit of a ladder program downloaded to each CPU is called a project. Before WideField, all devices available were provided as global devices. 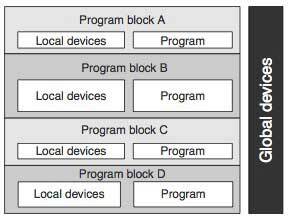 With WideField, two types of devices can be used independently as shown in Figure 4: global devices provided for each project and local devices provided for each program block. Addresses are assigned to local devices independently within each program block, so the user need not worry about device conflict with other program blocks while programming. A program block using local devices can be used for a different ladder project as is. Component macros also boost the improvement of program quality and reusability of programs. Figure 5 outlines component macros in WideField. By registering frequently used sets of actions as component macros while programming, the macros can be read and used by different projects and program blocks as common parts. A component macro can also use independent local devices, thus allowing each macro to be reused freely as a black box. 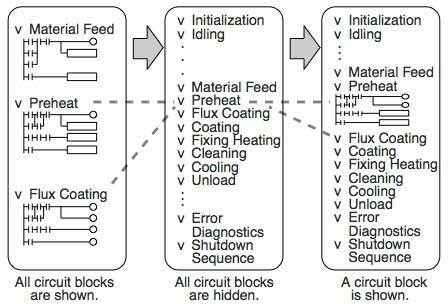 Traditionally, the comments coded for circuits in a program and the I/O comments for devices were the only visual help to understand a program. Nevertheless, as programs have expanded enormously, it has become difficult to understand each program solely by those comments. WideField presents improved visibility of programs and displays a program in the form of a hierarchical "tree" view. It is general practice to write a circuit comment for each circuit of a long strip of ladder diagram to clarify the intended actions. In the hierarchical "tree" view of WideField, the user can hide and show each circuit block under the circuit comment (just like expanding and collapsing the tree) to help grasp the entire program structure and explore and edit areas of interest with ease (see Figure 6). WideField, as a Windows-native application, fully uses the advantages of the Windows system to allow effortless data exchange with Windows-based applications and intuitive operations. WideField supports an image copy function for data exchange with word processor applications such as Microsoft Word. For example, by selecting a ladder program and copying its image to a Word document, all the data contained in the ladder circuits, including the information of the ladder, signal names, device addresses, and I/O comments, are pasted to the Word document. Thus, the efficiency of engineering document preparations can be largely improved. Also, signal definitions can be copied and pasted between Excel and WideField in both ways by the drag-and-drop technique. WideField is provided with Windows system-standard window preference settings and operability so that each user can customize the appearances of its windows as he/she wishes. Besides, although programming under the Windows environment is usually conducted using a mouse, WideField also supports the instruction input method by way of entering mnemonics via keyboard for experts of conventional programming tools. We are committed to improve WideField and the FA-M3 R to enable the continuous supply of controllers meeting the ever- changing user's needs and performance requirements, and help increase the competitiveness of equipment of our customers over their competitors'. Windows, Microsoft Word, Microsoft Excel, and Microsoft are registered trademarks of Microsoft Corporation. WideField is a registered trademark of Yokogawa Electric Corporation.